We earnestly believe in enlightening the youth with knowledge, encourage higher studies and enhance employability. We strive to achieve this not only through classroom teachings but through community interactions through different mediums. 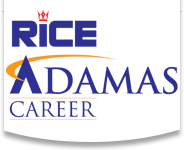 Rice adamas career conducts classes in Engineering Entrance Coaching and Medical Entrance Coaching. It is located in Kankurgachi, Kolkata. It takes Regular Classes- at the Institute.